Use a reliable torque wrench to tighten the parts listed to insure proper tightness without straining or distorting parts. These specifications are for clean and lightly lubricated threads only; dry or dirty threads produce increased friction which prevents accurate measurement of tightness. 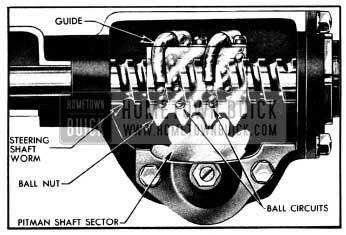 The 1950 Buick steering gear is the recirculating ball worm and nut type. The worm on lower end of the steering shaft and the ball nut which is mounted on the worm have mating spiral grooves in which steel balls circulate to provide a frictionless drive between worm and nut. See figure 7-1. Two sets of 30 balls are used, with each set operating independently of the other. The circuit through which each set of balls circulates includes the grooves in worm and ball nut and a ball return guide attached to outer surface of nut. When the wheel and steering shaft turn to the left the ball nut is moved downward by the balls which roll between the worm and nut. As the balls reach the outer surface of nut they enter the return guides which direct them across and down into the ball nut, where they enter the circuit again. When a right turn is made, the ball nut moves upward and the balls circulate in the reverse direction. See figure 7-1. Teeth on the ball nut engage teeth on a sector forged integral with the pitman shaft. The teeth on the ball nut are made so that a “high point” or tighter fit exists between the ball nut and pitman shaft sector teeth when front wheels are in the straight-ahead position. The teeth of sector are slightly tapered so that a proper lash may be obtained by moving the pitman shaft endways by means of an adjusting screw which extends through the gear housing end cover. The head of adjusting screw and a selectively fitted shim fit snugly into a T-slot in the end of the pitman shaft, so that the screw also controls end play of shaft. The screw is locked by an external lock nut. See figure 7-2. The pitman shaft is carried in two bronze bushings in 1950 Buick steering gear housing and one bronze bushing in housing side cover. 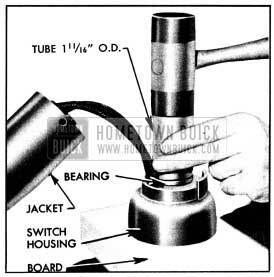 A spring-loaded leather seal in housing prevents leakage of lubricant at outer end of the shaft. See figure 7-2. The lower end of the steering shaft is carried by two spherical roller thrust bearings which bear against spherical seats on the ends of the shaft worm. The outer race of the upper thrust bearing is pressed into the gear housing. The outer race of the lower thrust bearing is formed in the thrust bearing adjuster which screws into the housing end cover and is locked by a nut. See figure 7-12. The upper end of steering shaft is supported by a ball bearing mounted in the direction signal switch housing on upper end of the steering column jacket. The upper end of steering shaft has a serrated taper seat for the steering wheel which is retained by a nut and lock washer. 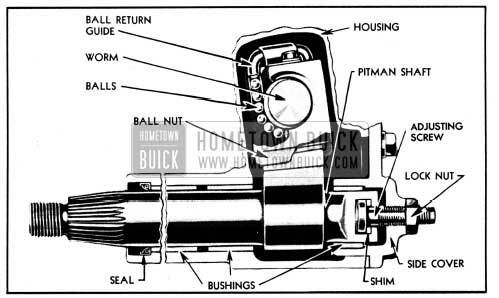 The 1950 Buick steering gear column jacket is bolted to a flange on steering gear housing, at which joint a felt seal is located to prevent engine noise and fumes from passing through jacket into the car body. The column jacket houses the steering shaft, transmission control shaft, and the selector control rod when required for synchromesh transmission. The column jacket is supported below the instrument panel by a split “pillow-block” type bracket attached by two bolts. A rubber liner is located between the jacket and the bracket to eliminate squeaks at this point. The steering wheel height may be changed slightly from production standard if necessary (par. 7-5). A bracket on the frame side rail helps to support the 1950 Buick steering gear housing which is attached to bracket and side rail by clamps and four long bolts. The front lower bolt serves as a pivot and the other bolts pass through slotted holes in the frame bracket and side rail to provide adjustment for vertical alignment of 1950 Buick steering gear assembly. The clamps bear against the cylindrical extension of gear housing so that housing can be turned in clamps to provide for sideways alignment of the assembly. See figure 7-3. The steering tie rods, which connect the pitman arm to the steering arms on the steering knuckles, are direct center point steering type. The right (long) tie rod is joined to the left (short) tie rod and to the pitman arm by ball stud and spring-loaded bearing connections which provide free movement in all required directions without lost motion. The ball studs riveted on the left (short) tie rod and the pitman arm seat between pairs of ball socket type steel bearings contained in the left end of the right (long) tie rod. A bumper of rolled stock, keyed in place by the lubrication fitting, forms a spacer and a lubricant reservoir between the two pairs of bearings. Heavy coil springs on each side of the pitman arm ball stud bearings and a threaded plug in the end of tie rod provide proper pressure between both sets of bearings and the ball studs. Flanged bumpers extending through both springs act as spring guides, permit a restricted movement of pitman arm ball stud and bearings as the springs absorb road shocks, and prevent the bearings from spreading and releasing the ball stud in the event of spring breakage. The spring tension and the clearances at ends of bumpers are adjusted by the threaded tie rod plug. See figure 7-4. The openings through which the ball studs enter the tie rod are protected by pressed steel dust covers to keep lubricant in and dirt and water out. On Series 40-50, the tie rods are connected to the tie rod ends by internally threaded sleeves which provide for toe-in adjustment. The sleeves are slotted and provided with clamps at each end to lock them in place. See figure 7-4. On Series 70, each tie rod end screws into a sleeve which, in turn, screws into the end of each tie rod. The tie rod sleeve provides for toe-in adjustment. The sleeve is locked in place by a clamp which fits over the slotted end of the tie rod. See figure 6-35. The tie rod end, which connects each tie rod to a steering arm, is a spring-load ball stud and socket unit assembly. A rubber dust seal fits over the stud where it emerges from the socket, to provide protection against entrance of dirt and water. See figure 7-4. This paragraph covers improper steering actions which are most likely to be caused by the 1950 Buick steering gear assembly or tie rods. Improper steering actions which are most likely to be caused by chassis suspension members are covered in paragraph 6-11. 1950 Buick Steering gear or tie rods adjusted too loose or worn (par. 7-4). Loose pitman arm or loose steering arms. Front wheel bearings incorrectly adjusted or worn (par. 6-14). 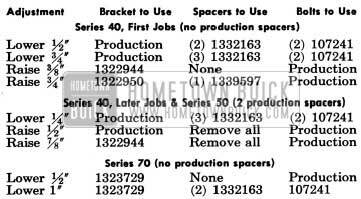 Steering knuckle bushings or king pins worn (par. 6-15). Low or uneven tire pressure (par. 6-8). 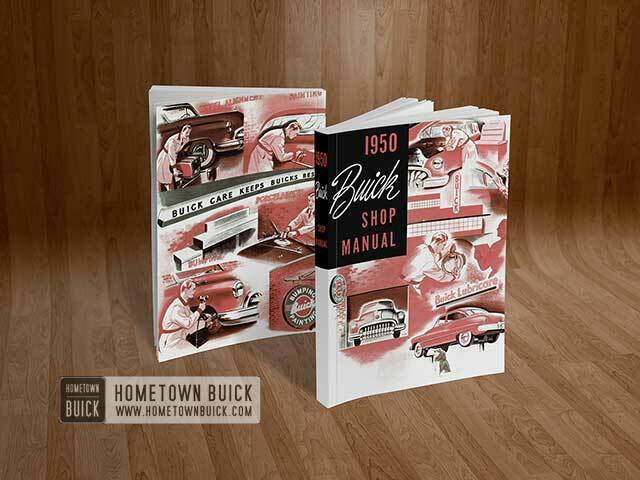 Insufficient or improper lubricant in 1950 Buick steering gear or front suspension (par. 1-1 and 1-2). 1950 Buick Steering gear to frame misalignment (par. 7-4). 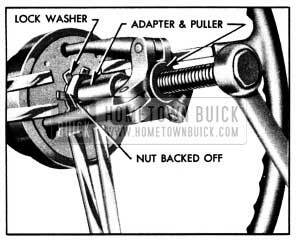 1950 Buick Steering gear or tie rods adjusted too tight (par. 7-4). Front wheel alignment incorrect in one or more angles (par. 6-30). Frame bent or broken (par. 9-2). 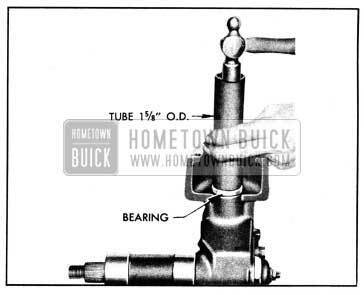 Insufficient or improper lubricant in 1950 Buick steering gear (par. 1-2). Excessive back lash between ball nut and pitman shaft sector in straight ahead position or worm thrust bearings adjusted too loose (par. 7-4). NOTE: On turns a slight rattle may occur, due to the increased lash between ball nut and sector as gear moves off the center or “high point” position. This is normal and lash must not be reduced to eliminate this slight rattle. Pitman arm loose on shaft, tie rod connections loose, or 1950 Buick steering gear loose at mounting brackets. IMPORTANT: Never attempt to adjust 1950 Buick steering gear while it is connected to tie rod. 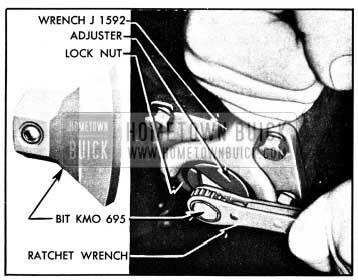 1950 Buick Steering gear must be free of all outside load in order to properly adjust worm thrust bearings and the lash between ball nut and pitman shaft teeth. Disconnect steering tie rod from pitman arm by unscrewing tie rod plug until bearings will release the ball stud. See figure 7-4. 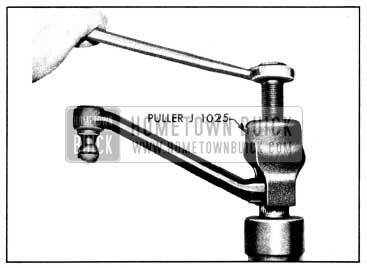 Check tightness of pitman arm nut with 18″ wrench. Turn steering wheel gently in one direction until it stops, then turn it back one revolution. CAUTION: Never turn wheel hard against stopping point as damage to ball nut assembly may res-ult. Check for lash between ball nut and pitman shaft by working the pitman arm. If a perceptible lash does not exist, loosen lock nut and turn pitman shaft adjusting screw counterclockwise, until lash can be felt when working pitman arm. See figure 7-5. This separates the worm thrust bearing load from the “high point” load caused by close meshing of ball nut and pitman shaft teeth. Turn steering wheel slowly from one extreme position to the other. Wheels should turn freely and smoothly through entire range. Roughness indicates faulty worm thrust bearings or brinelled races. Hard pull or binding indicates misalignment of steering gear assembly in mountings, or an excessively tight adjustment of worm thrust bearings. 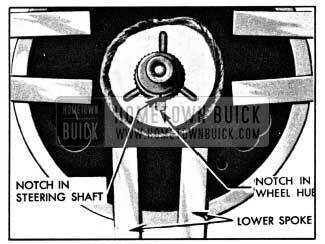 Any misalignment must be corrected before 1950 Buick steering gear can be properly adjusted. If binding exists, loosen the four steering gear to frame bolts and the two steering column bracket bolts. Center steering column in the cutout in dash panel and tighten column bracket bolts, then tighten the steering gear to frame bolts. 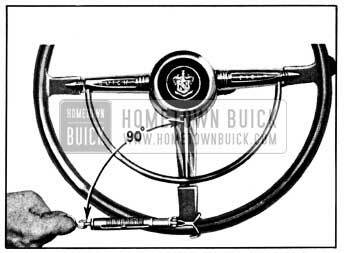 If binding still exists, check the 1950 Buick steering gear column jacket for evidence of being sprung which is usually indicated by a rippled or wavy surface, particularly at the lower end. A sprung jacket will throw the steering shaft upper bearing out of line with worm thrust bearings and create side pressure on steering shaft. NOTE: If 1950 Buick steering gear was out of alignment or jacket is sprung, check body mounting bolt which ?nay have loosened and allowed body to shift. Also check the serrations on pitman shaft; if serrations are twisted, replace the shaft. Tighten housing end cover bolts. Loosen worm thrust bearing adjuster lock nut, using Wrench J 1592. Turn thrust bearing adjuster, using Adjuster Bit KMO 695 and a ratchet wrench, until a slight load is felt when turning steering wheel near extreme positions, then tighten lock nuts. See figure 7-6. CAUTION: Do not back out adjuster far enough to permit thrust bearings to get out of line with ends of worm. After locking the bearing adjuster check the load on thrust bearings with steering wheel turned to near one extreme position. Apply Scale J 544-A to a spoke at rim of wheel and exert a steady pull while keeping the scale at 90 degrees to spoke as shown in figure 7-7. The pull required to keep wheel turning slowly should be between 7/8 and 1 1/8 pounds. Readjust to obtain this bearing load if necessary. Turn steering wheel from one extreme position to the other while counting the turns, then turn wheel back one-half the total number of turns and have the lower spoke pointing straight down. This places steering gear on the “high point” at which no lash should exist between ball nut and pitman shaft teeth. Tighten housing side cover bolts. Loosen lock nut and turn pitman shaft adjusting screw clockwise until lash between ball nut and pitman shaft teeth is just removed. Work pitman arm back and forth to feel for lash. After tightening adjusting screw lock nut, rotate steering wheel back and forth through the “high point” range and check for tight spots. Check pull at wheel with Scale J 544-A as described above. The pull required to keep wheel moving through “high point” should be between 2 and 2 1/4 pounds. Readjust if necessary to remove tight spots and obtain specified load at wheel rim. NOTE: If lash cannot be removed at “high point,” or if gear load varies greatly and feels rough, the gear assembly should be removed for inspection of internal parts (par. 7-8 and 7-9). Connect steering tie rod to pitman arm, being careful to properly seat the bearings around ball stud. Make sure that the pressed steel dust cover properly covers opening around ball stud. See figure 7-4. Turn the tie rod plug up solid then back off two turns and install cotter pin. Road test car for ease of steering. If 1950 Buick steering gear was adjusted to specified load limits and hard steering exists, the front suspension members should be checked for lubrication and alignment and tire inflation pressures should be checked. When car is moving straight ahead, the lower spoke of steering wheel should be straight down, or not over 5/8″ to either side of straight down position. If lower spoke is too far to either side, check steering wheel for proper position on steering shaft (par. 7-6) and check tie rods for equal adjustment and toe-in (par. 6-30). It is important to have the 1950 Buick steering gear in the no-lash range when car is moving straight forward. The 1950 Buick steering wheel is set in production at the proper height for the majority of drivers. Raising the wheel from the standard position may affect visibility and lowering the wheel may prove awkward for the average driver. A limited amount of change in wheel height may be made where this is desirable in exceptional cases. The Series 40-50 steering wheels may be raised or lowered, but the Series 70 steering wheel can only be lowered from the standard height. The alteration is effected by changing the number of spacers located between the steering column bracket and the support bracket on instrument panel, and by substituting longer bolts and a different steering column bracket when required. When changing steering wheel height first loosen the four steering gear to frame bolts and disconnect the dash insulation retainer from toe panel. After installation of required new parts, center the steering column in the cutout in dash panel and tighten the column bracket bolts before tightening the four steering gear to frame bolts, to make sure that steering column is not held in a sprung position. Before attaching the dash insulation retainer to toe panel, pack the opening around column with a piece of jute filler to prevent fumes from entering the body. Check and adjust front wheel toe-in (par. 6-30). Disconnect wire at horn cable connector on steering column to prevent horn from blowing. On solid spoke steering wheel, carefully pry out the horn button cap, then remove the contact cup, spring, and contact plate which are attached to wheel hub by three screws and spacer bushings. On flexible steering wheel, pry off the monogram and bezel assembly and remove the horn button operating wheel which is attached by three screws. Set direction signal switch in “off” position to avoid possible damage to switch operating mechanism. Flatten the tab of lock washer, then back off steering wheel nut several turns but do not remove nut. Apply Puller J 1566 and adapter (fig. 7-8) and pull wheel back to nut. NOTE: If wheel hub is very tight on shaft, apply a moderate strain with puller then tap end of puller screw to break hub loose from shaft without distorting wheel hub. Remove puller, nut, and lock washer, then remove steering wheel. When a steering wheel is being replaced it is necessary to remove the direction signal switch cam from the old wheel and install it on new wheel. The cam, spring washer and bronze washers may be removed from hub of steering wheel by removing the snap ring. Install cam and washers as described in paragraph 10-64. Before installing steering wheel, set signal switch in “off” position to prevent the cam from striking the switch trigger and damaging the switch operating mechanism. Location marks for proper installation of steering wheel on steering shaft are provided to insure a vertical position of the steering wheel lower spoke when front wheels are in straight ahead position. The upper end of steering shaft has a small location notch, the solid spoke wheel has a keyway, and the flexible wheel has a U-shaped notch. These location marks on shaft and wheel must be in line when wheel is installed. See figure 7-9. Install lockwasher with tongue engaged in keyway or notch in wheel, install and tighten wheel nut securely, then bend one tab of lockwasher up against a flat on nut. On solid spoke steering wheel, install contact plate, horn blowing spring, and contact cup, attaching these parts to wheel hub with three spacer bushings and screws. NOTE: Horn blowing spring is slightly dished-install so that inner edge does not bear against contact plate. Install horn button. On flexible steering wheel, install horn button operating wheel and the monogram and bezel assembly. The crest must be right side up with wheel in straight ahead position. Connect wire to horn cable connector on steering column, then adjust timing of direction signal switch cam (par. 10-63). Disconnect direction signal switch wires from terminals on the fuse block. Remove steering wheel (par. 7-6). Remove steering shaft upper bearing spring and spring seat. Remove dial housing (Dynaflow only) and signal switch housing from steering column jacket, pulling switch wires up far enough to permit working on underside of switch housing. Pry out old control shaft bearing, which will allow the control lever housing thrust washer, plain washer and spring washer to be removed for inspection. Replace thrust or spring washer if worn. Support the signal switch housing on a board held on the knees while installing the spring washer, plain washer, and thrust washer in the order named. Drive the new control shaft bearing into housing, using a square-ended heavy-walled tube 1 11/16″ outside diameter. See figure 7-10. CAUTION: Use care to avoid scoring this fabric bearing, which would cause hard shifting of control lever. Install signal switch housing and dial housing on column jacket, connect signal switch wires to terminals on the fuse block, install spring seat and spring, and install steering wheel according to location marks (par. 7-6). Disconnect signal switch wires from terminals on the fuse block. Drive old steering shaft bearing from switch housing, then drive new bearing into housing while supporting the housing on a board held on the knees. Drive only against outer race of bearing. NOTE: Bearing can also be installed after installation of switch housing on column jacket, if preferred. 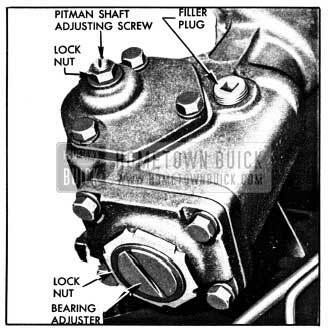 Disconnect the pitman arm from the steering tie rod by unscrewing tie rod plug until bearings will release the ball stud. On Series 70 only, remove air cleaner assembly. Disconnect fuel and vacuum pipes from carburetor and carefully move them out of the way. Disconnect clutch linkage anti-rattle spring from the shift idler lever pin bracket and disconnect upper shift rod from control shaft lower lever. On synchromesh transmission jobs, disconnect selector rod from selector control lever and unhook the anti-rattle spring. Disconnect wires from horn cable connector, back up light switch, and neutral safety switch (Dynaflow cars only). Pull speedometer cable from clip and then remove horn cable connector from column jacket to avoid damage during removal of gear assembly. Disconnect one end of cross brace at cut­out in cowl and swing brace to one side. Move front seat all the way back and cover the seat and back cushions. Remove dash insulator retainer and steering column pad. Pull back the floor mat and remove pedal plate attached to toe panel. Remove steering wheel (par. 7-6) and the upper bearing spring and spring seat. Remove shift control lever and signal switch control lever. Remove steering column bracket and any spacers located between bracket and the support bracket on instrument panel. Remove the 1950 Buick steering gear to frame bolts and clamps and carefully support the steering column to avoid damaging column jacket. Move gear assembly to rear as far as possible, turn assembly over so that pitman arm is uppermost, then lift forward end up between engine and fender and move forward to remove gear assembly from car. It is advisable to have a helper guide the column jacket and signal switch housing through the cutout in cowl panel to avoid damaging the finish of these parts. Leave frame bracket bolts loose until steering column bracket and any original spacers are installed. Center steering column in cutout in dash panel and tighten the column bracket bolts, then tighten the frame bracket bolts. Connect signal switch wires to terminals on the fuse block. Before installing transmission control lever, coat inner end and the socket in selector rod (synchromesh) or stop pin (Dynaflow) with Lubriplate. If a new bearing is being installed on control lever, the large diameter of bearing must be toward the lever knob. During installation of lever be careful to draw housing nut tight so that shoulder in nut will bear against flange of bearing seat and lock the seat in place. Install steering wheel with location marks in line (par. 7-6). When connecting tie rod to pitman arm be careful to properly seat the bearings around the ball stud and make sure that the pressed steel dust cover properly covers opening around ball stud. Turn tie rod plug up solid then back off two turns and install cotter pin. Fill 1950 Buick steering gear housing to filler plug opening with Saginaw All-Season Steering Gear Lubricant, available through United Motors Service. On car equipped with Synchromesh transmission, check adjustment of transmission controls as described in paragraph 4-11, when connecting shift rod to control shaft lower lever. On car equipped with Dynaflow Drive, check transmission control linkage as described in paragraph 4-17. Check setting of neutral safety switch as described in paragraph 10-34. Check adjustment of back-up light switch as described in paragraph 11-3. Road test car for ease of steering as described in paragraph 7-4, step 12. Remove nut, lock washer, and pitman arm using Puller J 1025 to remove pitman arm; the gear assembly will be damaged if arm is driven or pried off pitman shaft. See figure 7-11. Remove dial housing (Dynaflow only) and direction signal switch housing from column jacket and leave hanging by wiring. Remove control lever housing shield, loosen control lever housing clamp bolt by inserting screwdriver through slot in jacket, then slide housing from transmission control shaft. Remove housing lower thrust and plain washers. Remove back-up light switch, neutral safety switch and shift control detent (Dynaflow only) , if these parts are installed, then remove steering column jacket and seal from gear housing. Remove control rod (synchromesh only) and control shaft from jacket if inspection of these parts is desired. Pull signal switch wires through slot in jacket and remove switch housing assembly from jacket. Loosen adjusting screw lock nut, then remove housing side cover with pitman shaft attached. Remove gasket. Separate pitman shaft from side cover by unscrewing the adjusting screw. See figure 7-12. Loosen lock nut and back off worm thrust bearing adjuster several turns, then remove housing end cover and gasket. Remove lower thrust bearing, steering shaft, and upper bearing from housing. Remove ball return guide clamps and guides from ball nut, turn ball nut over to remove balls, then remove ball nut from steering shaft worm. Clean and inspect all ball and roller bearings and races, including race in housing, as described under Bearing Service (par. 1-11, 1-12). Thoroughly clean all other parts in clean kerosene or other solvent and wipe dry with clean cloths. Do not clean signal switch housing assembly with solvent as switch and wiring will be damaged. Inspect pitman shaft bushings in gear housing and end cover. Replace bushings in housing and replace end cover if bushings are worn excessively. It is advisable to replace the pitman shaft grease seal in housing to avoid possible leakage of lubricant. The seal must be installed with feather edge toward inside of housing. Inspect oil shedder and control shaft bearing in gear housing. If bearing is of doubtful condition replace it, using a square-ended heavy walled tube 1 5/8″ outside diameter to drive new bearing squarely into housing. See figure 7-13. Use care when installing new bearing as hard shifting of control lever will result if this bearing is damaged. Inspect steering shaft for wear or brinelling in ball and roller bearing races, which would require replacement of shaft; check shaft to make sure it is straight. Inspect teeth of ball nut and pitman shaft. If scored or excessively worn it is advisable to replace both parts to insure proper mating of teeth. Check serrations of pitman shaft; if twisted, replace the shaft. Inspect steering column jacket for distortion. A rippled or wavy feeling of jacket surface, particularly at lower end, will usually indicate a sprung jacket. Replace jacket if sprung or otherwise damaged. Inspect control shaft upper bearing, control lever housing thrust washer, and steering shaft upper bearing in signal switch housing. Replace unserviceable parts as described in paragraph 7-7. Lubricate bearings and gears with specified 1950 Buick steering gear lubricant (par. 7-8, step 6) at time of assembly. Use all new gaskets to avoid oil leaks. When assembling ball nut on worm be sure to place 30 balls in each circuit, making a total of 60 balls. When installing pitman shaft avoid damaging or turning the feather edge of the leather grease seal in gear housing. Snap Ring Replacer J 1267 (fig. 4-38) may be inserted into the seal to expand it. As pitman shaft is installed the replacer will be pushed out so that shaft will enter the expanded seal without damaging it. When inserting transmission control shaft in lower bearing, and when installing signal switch housing on jacket, use care to avoid scoring the fabric in control shaft bearings. Scored bearings will cause hard shifting of control lever. The control lever housing shield is wider on one side of hole and this side must be placed below control lever. Install pitman arm on shaft so that arm is parallel with steering column when gear is in straight ahead or no-lash position. Temporarily install steering wheel and adjust worm shaft thrust bearings for proper load and pitman shaft for proper gear lash as described in paragraph 7-4. Remove wheel.